Our Award Winning Garden Room company has become the first of its kind to win the seal of approval from a consumer watchdog. 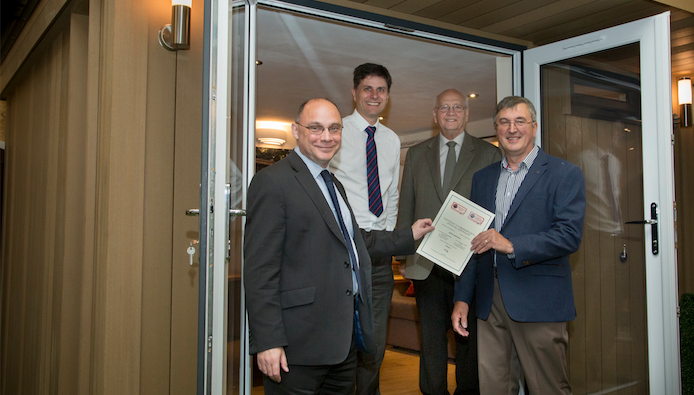 The Buy With Confidence scheme, run by Trading Standards teams around the UK, has welcomed Deeside-based Rubicon Garden Rooms as a member. Flintshire County Councillor Chris Bithell visited Rubicon’s HQ on Deeside to present the company’s founder and Managing Director John Lyon with a certificate showing that Rubicon is now an accredited member of the Buy with Confidence scheme. As of August 2017, Rubicon is the first and only Garden Room firm of its kind in the UK that has been accredited by the highly regarded consumer protection scheme. The company has more than ten years of experience in the building industry, and specialises in the manufacture and installation of Garden Buildings to create Home Offices, Granny Annexes for older relatives and teenagers, Hobby Rooms, Garden Studios for art and music enthusiasts, and all kinds of Garden Leisure Buildings. Fully insulated, its hi-tech wood fibre panelling enhances comfort and is truly Zero-Maintenance. John said: “We care about our customers and we already provide a comprehensive 10 year structural guarantee on all our products. “It is important to us that our customers know that they can trust us - we operate fairly, honestly and to a strict code of conduct. That’s why we applied to join the Buy With Confidence scheme as it’s an independent validation of our services and the quality of our Garden Rooms and Garden Offices together with the construction methods we use. 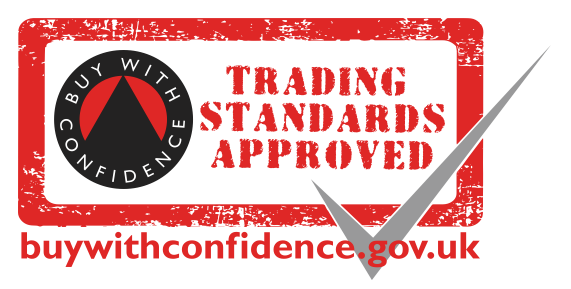 “The team at Trading Standards checked our Customer Testimonials and spoke to them about the work we have carried out, looked at all our audit trails, our accounts and contract terms, checked that all staff had been Disclosure and Barring Service (DBS) certified and satisfied themselves about many other aspects of the business. “They went through everything in detail - this hasn’t been a simple exercise, but I am delighted that we passed their comprehensive checks. 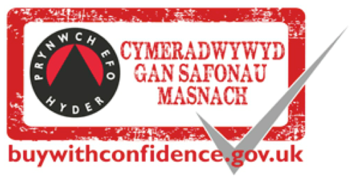 Buy With Confidence is the largest scheme of its kind nationally and was set up to weed out rogue traders. It is administered by local authority Trading Standards teams to ensure it is independent, protecting the rights of both consumers and businesses. Councillor Bithell, Portfolio Holder for Planning and Public Protection, said: “I am delighted that Rubicon Garden Rooms has become a member of the Buy With Confidence scheme. 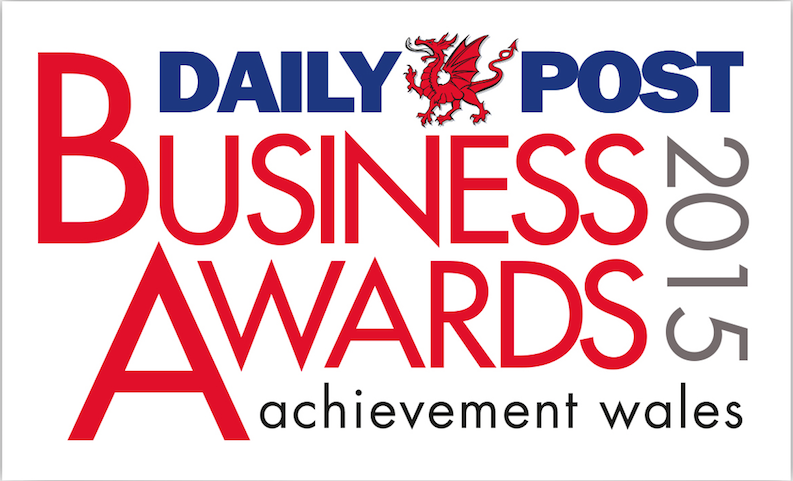 “This accreditation will inspire confidence in potential customers in the company’s ability deliver excellent customer service, and that it operates fairly and honestly. “It has also been very interesting to visit Rubicon’s showroom on Deeside and hear about the company’s achievements and plans for expansion in the coming months. Flintshire County Council Trading Standards Team Leader Richard Powell has been working closely with Rubicon Garden Rooms during the application process. He said: “In order to become a Buy With Confidence member, a business must first apply or be recommended to join the scheme and must then pass a set of tailored background checks. “Membership is not given lightly and not everyone gets in – amongst other checks, each applicant will have their complaints history reviewed and will receive a visit from Trading Standards. The company's financial accounts and trading history will also be vetted. “Good references are required from previous customers and applicants must agree to abide by the scheme’s code of conduct, which requires them to follow the letter and spirit of the law. Criminal records basic disclosure may also be required in some circumstances. “Only if all the scheme requirements are met, will a business be granted membership, and their conduct will continue to be monitored. Customers can expect any problems to be dealt with fairly by the business, or they can turn to Trading Standards for advice in the event of an unresolved issue.